Despite concern expressed by some respondents about the potential impact of government data collection programs and criminal hacking, other issues clearly outweigh surveillance for the bulk of these journalists. IRE journalists were presented with a list of four challenges facing today’s journalists and asked to rank them in order from the biggest challenge to the smallest. Of these four choices, the vast majority of respondents (88%) place “decreasing resources in newsrooms” at the top of the list. None of the other options was named as the top priority by more than 5% of these journalists. Legal action against journalists was most commonly named as a second place priority; 56% place it second. And while just 4% see electronic surveillance as the biggest of these challenges, another 28% place it second on their list. 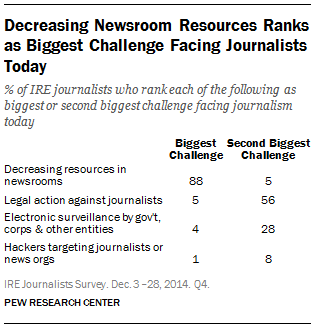 Most revealing, 61% of respondents rank hacking of journalists or news organizations as the smallest challenge of the four, making it the clear lowest priority. To underscore these findings, nearly all of these investigative journalists (97%) say that the benefits of digital communications like email and cellphones outweigh the risks. This belief cuts across all subgroups of respondents. Even among respondents whose own work has been impacted by concerns about electronic surveillance and hacking, just 7% say the risks posed by digital technologies outweigh the benefits.